Review by AllTheBestFights.com: 2016-04-02, great performance by both boxers: Robert Helenius vs Johann Duhaupas gets three stars. The undefeated Robert Helenius entered this fight with a perfect record of 22-0-0 (13 knockouts) and he is ranked as the No.32 heavyweight in the world. He fought three times last year winning over Andras Csomor, Beka Lobjanidze and Franz Rill. His opponent, Johann Duhaupas, has an official boxing record of 33-3-0 (20 knockouts) and he entered as the No.39 in the same weight class. He lost to Deontay Wilder last year (=Wilder vs Duhaupas) but then he came back to win against Marcelo Luiz Nascimento. 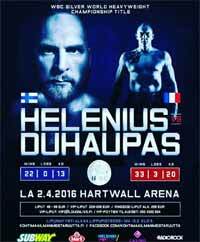 Helenius vs Duhaupas is valid for the vacant WBC Silver heavyweight title. Watch the video and rate this fight!